The hot new celebrity trend which is here to stay Semi-Permanent Eyelash Extension giving you longer, thicker and natural looking eyelashes. Semi- Permanent Eyelash Extensions are worn by celebrities like Nicole Kidman, Star Jones, Paris Hilton, Gwen Stefani, Lucy Liu, Naomi Campbell, Liz Hurley to name a few. Hollywood is hip to the latest trend. But if you blinked you may have missed it: People are getting eyelash extensions. 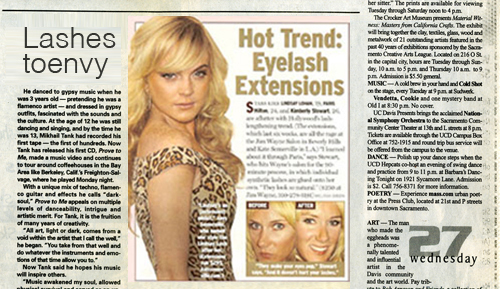 Eyelash extensions started in Asia and made their way west. Unlike traditional false eyelashes that only last one day and are applied on a strip, synthetic eyelash extensions are glued to eyelash hairs one by one with tweezers. The process takes two hours and they last about two months. It typically costs between $300 and $500. Beauty salons everywhere are catching on. At the Louis Licari Salon in New York City, eyelash extensions are so popular that appointments must be booked up to months in advance.